Two CHYC teams won medals at the 2019 Cheer/ Dance Extreme’s National Championship by the Sea competition in Virginia Beach. 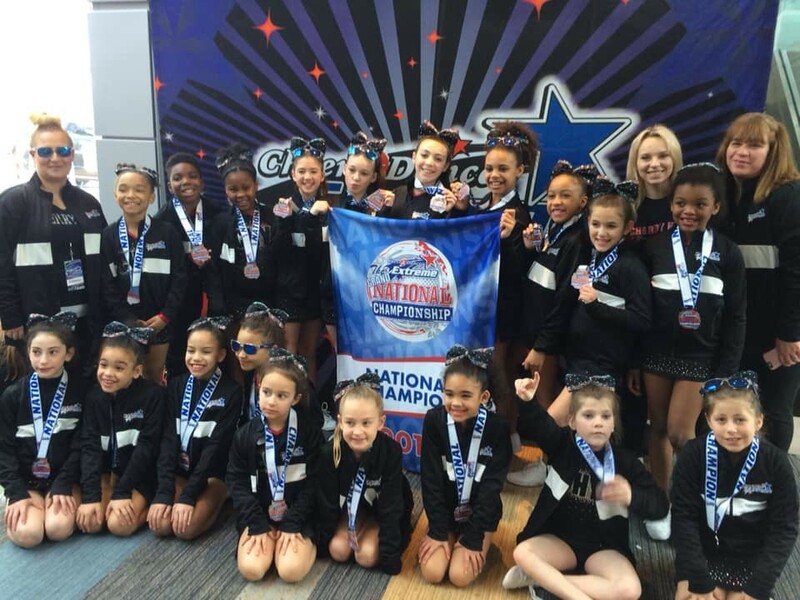 The Cherry Hill Youth Cheerleading Youth Level 1 team celebrates its first place finish at Cheer/ Dance Extreme’s National Championship by the Sea competition on March 10. On March 9 and 10, Cherry Hill Youth Cheerleading competed in Cheer/ Dance Extreme’s National Championship by the Sea competition in Virginia Beach. This was a weekend-long competition showcasing cheerleading and dance organizations from the East Coast. Each team competed twice, once on Saturday and once on Sunday, with awards taking place on Sunday morning. CHYC ‘s Youth Level 1 team (Dynamites) walked away with first place medals and championship jackets. The Senior Level 2 team (Explosions) left with second place medals. Both teams performed extremely well and represented the proud legacy of Cherry Hill. Cherry Hill Youth Cheerleading is having an open house on March 30 from 9 a.m. to noon to showcase the talents of the cheerleaders and take registration for the upcoming 2019–2020 season. CHYC is also hosting a Cheer Prep Program for anyone interested in pursuing cheerleading. Registration for the three-day camp can be found through the Cherry Hill Recreation catalog and website. Residents can also visit chyconline.com or like the group on Facebook to find out more about programs or events.